TODA Heavy Duty Timing Chain can easily be identified from the standard Honda product by the timing mark locations being gold in color and the TODA name embossed on the plate. Advanced punch manufacturing techniques used in the making of the TODA Heavy Duty Timing Chain, have improved accuracy and reduced edge burrs leading to reduced friction and smoother chain operations. With improved accuracy, small but important improvements to the design of the TODA Heavy Duty Timing Chain have been possible. 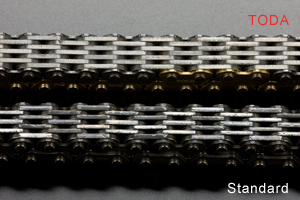 Areas such as a larger plate shape and larger pin diameter have helped to improve the chains strength and to reduce chain stretch. Up until now, tuning specialists have had to use the standard timing chain. Now there is a product that after reviewing the design and detailed modifying has gained improved accuracy and durability. 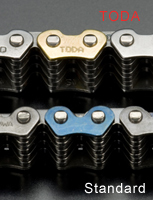 This is TODA Racing's Heavy Duty Timing Chain. 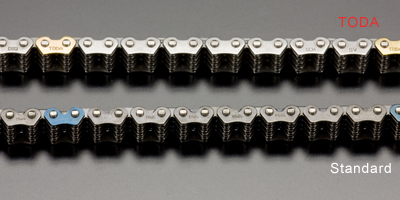 With the extra demand of hi-performance driving even with the standard road engine and/or components such as camshafts that place extra stress on the valve train system, improved chain strength is important. To attain the most from the improved durability, reduced friction, improved camshaft timing accuracy, we recommend using the TODA Heavy Duty Chain Tensioner (K20A/K24A or F20C/F22C), in combination with TODA's Heavy Duty Timing Chain.